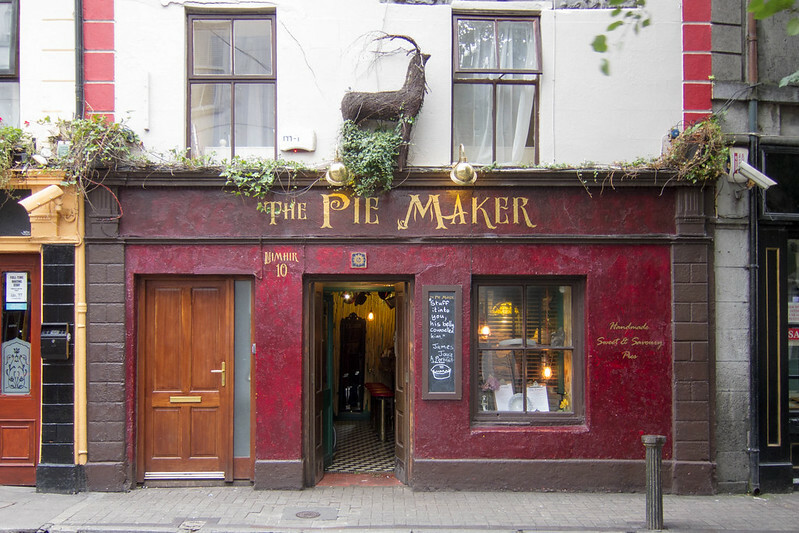 I photographed a whole bunch of pub and shop exteriors while I was in Ireland. I liked how simple and clean yet appealing the buildings were. I liked the shallow setbacks from the streets for the cozy feel they created. I shot them straight on, face forward. Despite all the great color I found in these buildings, I shot them with black and white in mind. Perhaps I’m inspired by the recent work of photo blogger Dan James, who’s been desaturating Fujicolor 200 as an inexpensive way to get black and white photos. And so I desaturated several of these photos to see how they turned out. There were some things to like, such as how the yellow turned into a creamy gray. 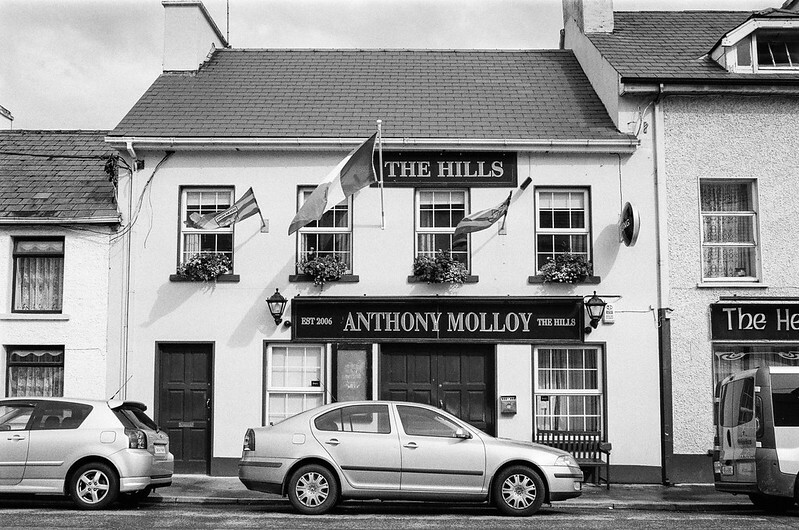 I also shot this pub with my Nikon N2000 on Kodak T-Max 400. Notice the greater contrast, and also how the Anthony Molloy building shows up as nearly white on film, as opposed to gray in the desaturated digital image. I’m not sure what, if anything, this comparison says. So many variables are at play here, not the least of which is that the N2000 appears to have metered for a more generous exposure than the S95 did. And heaven knows I can adjust contrast and exposure all day long in Photoshop to bring the digital desaturation more into line with the film photo. But I wish I had shot a few more storefronts on both film and digital to compare them, as I’m fascinated to study the differences. I desaturated a few other straight-on building shots, too. 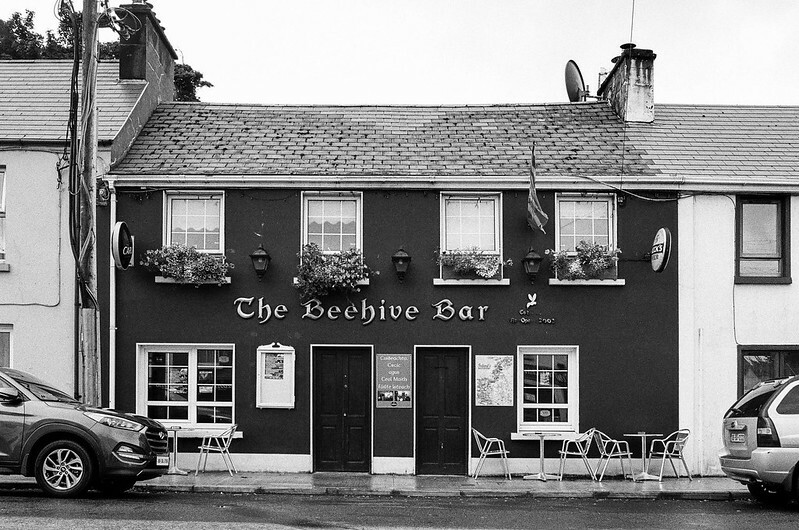 Here’s one from Ballinrobe, a rural community in County Mayo. 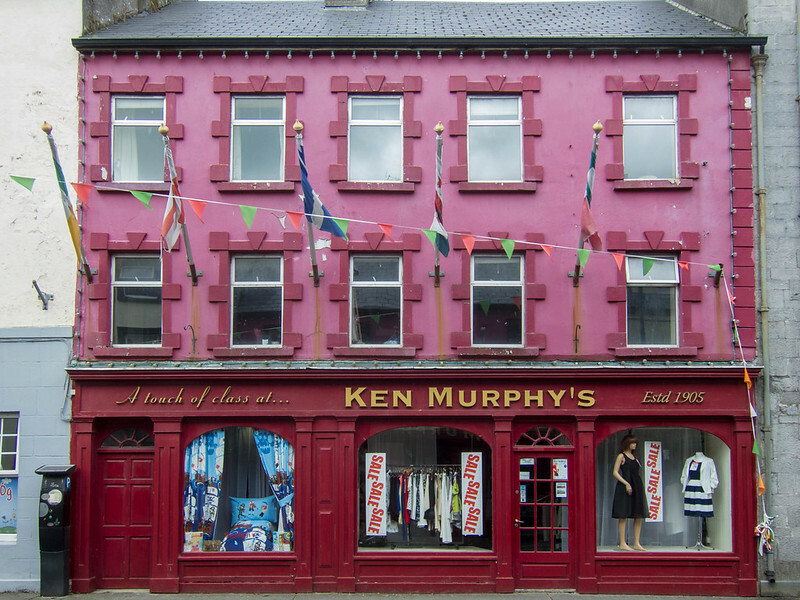 This rich red storefront in Galway really stood out, and was an obvious candidate for this series. The desaturation ended up looking pretty flat, however. I bet it would benefit from further adjustments, especially to increase contrast. I shot a couple other storefronts with the N2000. I just like the higher-contrast I got with that 35mm lens and the T-Max 400 better than the color digital shots I desaturated. Letterkenny, Ireland. Nikon N2000, 35mm f/3.5 AI Nikkor, Kodak T-Max 400. It’s all subjective. Maybe you like the lower-contrast look of the desaturated photos. There are black-and-white films out there that give a flatter look. I’ve used some of them but I keep returning to Tri-X and T-Max. I guess I just like contrast in black-and-white photos. If I am looking at B&W, I also want lots of contrast, and tack sharp focus. What I really like is the commercial architectural & industrial photos from the ’30s & ’40s, when they were still doing everything with medium and large formats. I like contrasty and crisp BWs too. Thanks for the tip on Silver Efex! I’ve heard of it but had forgotten about it. Nice to know it’s free now! You can achieve quite a bit more control in photoshop for b&w conversions by using a color channel adjustment layer. Select Layer/New Adjustment Layer/Channel Mixer/Ok. Then check the “Monochrome” box in the lower left of the pop-up. That gives you three sliders for adjusting Red, Green and Blue. Try initially adjusting Red to 70%, Green 30% and Blue 0%. Keep the total to 100% to maintain proper brightness. There are quite a few tutorials on the web for this technique including http://www.photoshopessentials.com/photo-editing/black-and-white/channel-mixer/. Outstanding! Thank you for the tip. I joined the pay-each-month Adobe plan earlier this year and am still learning everything Photoshop (and Lightroom, which I don’t like much so far) can do. Both in color, and B&W, the pictures are enjoyable, but the film B&W are (IMHO) better. As mentioned, Silver Efex is a great program. And, if all you did was desaturate and reduce vibrance, you have lost some of the ability LR can do when you use the Black & White portion of the HSL section – click it and then play with the sliders – you will see that is more effective than simple desaturation. Altogether, a nice series and comparison. So far I haven’t used LR for processing, just for cataloging. I’ll give the HSL stuff a look – thanks! Nice photo’s Jim, I prefer the B&W film pictures. 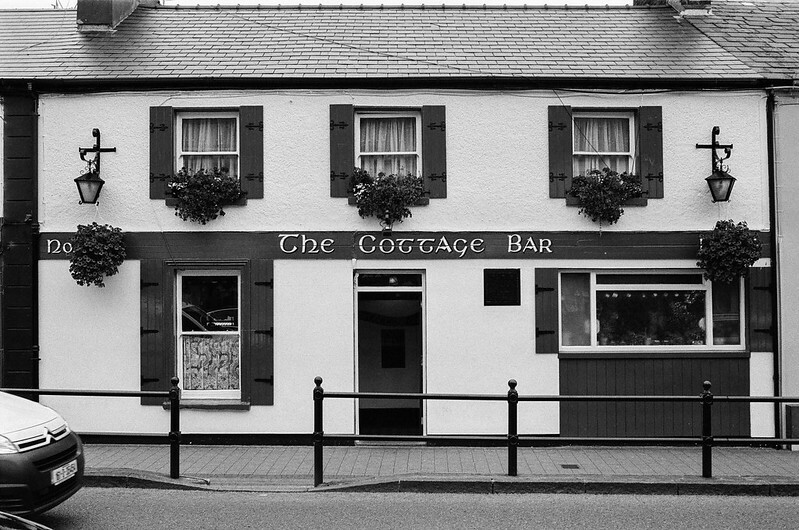 Did you have a drink in each of the pubs as they look most inviting. 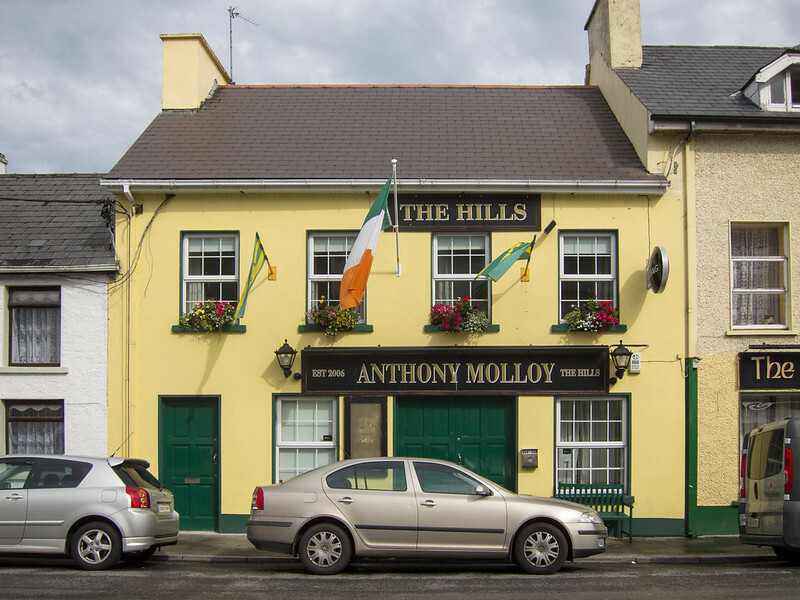 I did have a drink at some of these pubs! But not all of them; I was driving after all! I like the film better hands down. But then I am a confirmed black and white film-holic. I like the film shots better too. But I wonder if I can get that look on the digital photos through post-processing. It would be interesting to shoot similar scenes with your digital camera and then with colour film and desaturate both. Comparing pure b/w film with desaturated digital colour shots is always going to show significant differences, because as you say there are so many variables. Before I got into film in 2012 I shot exclusively with a Nikon Coolpix, which was (is!) a fantastic little camera. It had a “high contrast monochrome” setting which I used a lot straight in camera, as at that time I had no idea how to create b/w pictures otherwise. I really liked the look the photographs had and it got me hooked to a high contrast look for b/w which I always try to look for and create with film now. Does your Powershot have a b/w setting at all? Might be worth playing with if it gives you a quicker option with good results? The S95 doesn’t have a b/w setting. It has a bunch of other settings I can’t imagine ever using, but b/w, nope. I suppose I’m used to contrasty b/w. I wonder what those desaturated shots would look like printed. Interesting post, Jim – I hadn’t realised there would be such a difference ‘out-of-the-box’ with desaturated colour images and film. I’m sure with enough tweaking in Photoshop or Silver Efex you can create any look you want. It’s a couple of years since I used Silver Efex Pro but I think you can ‘get the look’ of particular films (Tri-X, HP5 etc) with little more than a couple of mouse clicks. I still prefer to use the actual films, though. Just a remark on the contrast thing – high contrast B&W images are very a la mode right now. Perhaps it’s the modern lenses, perhaps the advent of digital or the fact that most people now view images on computer screens (which give images that high-contrast, back-lit look) which has made this popular, I don’t know. Yes we all want our images to stand out, but sometimes I like to get my hands on a print with lots of delicious mid-tones. I downloaded Silver Efex and played with it for ten minutes last night. Sure enough, I got all sorts of interesting looks. I played with the Pie Maker shot and Silver Efex had a couple settings that immediately restored the punch, in b/w, that the color shot had natively. I think this is what keeps me taking pictures: trying things and seeing what happens. I didn’t get serious about photography until ten years ago, and have always been a digital film photographer in that time (develop, scan, see on screen) — and so all I really know is backlit computer screens as displays. When I used to post on internet sharing sites like Pbase and Flickr I found some photographers who were desaturating their images, not to b&w, but enough so that it appeared “vintage.” I admit I tried that too. Those were the days before the filters we have today. I couldn’t really get a signature vintage color look out of it, but I also desaturated to b&w a lot and I thought it was great for that purpose, just as you’ve shown in your pics. As for digital or film versions, it’s all subjective as you say. Interesting post and topic! Yeah, there isn’t a whole lot that’s objective in this post!